I went on a little road trip yesterday with my sweet man, so I had some time to enjoy being a passenger and peruse Julie Daniluk's "Meals that Heal Inflammation" book. 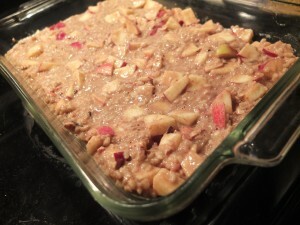 I stumbled upon this drool worthy recipe for "Apple Rice Bake", so I was excited to get home and try it out. 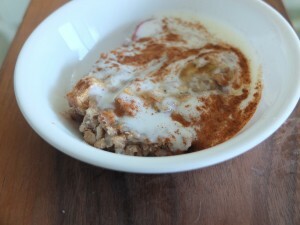 It was absolutely delicious for dessert and then I had it for breakfast this morning with some cinnamon and kefir! This recipe is loaded with cholesterol-lowering and detoxifying fibre (both soluble and insoluble), protein (from the brown rice and eggs -- which can be substituted if you're vegan) and energizing B vitamins. The only thing it's lacking is gluten -- and this is a good thing! Anything fellow Nutritionist Julie creates is amazing, as my Key Lime Pie is also adapted from an old recipe of hers. (Note: I made a few very minor modifications from her original recipe). Method: Use a fork to mix all the ingredients together in a large mixing bowl. Pour into a greased 11 x 7 x 2 baking dish and bake at 350F for 35-45 minutes. If you are using an egg substitute, bake 15 minutes longer. Makes 8 servings. Dessert: Add a dollop of Coconut Bliss dairy-free ice cream. Breakfast: Add some greek yogurt or kefir, like I did :) See photo. It tastes like a cross between rice pudding and apple pie. And if you don't already have it, I recommend her book because it's an absolute wealth of information and the recipes are a HUGE added bonus! If you enjoyed this recipe and you are either suffering from gluten-intolerance, celiac disease or just want to experiment with gluten-free eating, then register for my upcoming workshop: Gluten-free deliciously on March 10th before it sells out! Do you have a favourite healthy dessert recipe you would like to share? Feel free to post a link below. Or, do you have a favourite dessert ingredient that you use as a healthy substitute for something else? Do share! Don't forget to check out Joyous Health's February deal - Sugar Detoxing. This looks so good Joy! I love stuff like this for breakfast so will definitely be making a pan sometime soon! I've got my heart set on the cookbook of Julie's, I've only heard good things! This looks so delicious! I love anything with apples in it. Joy, I must say that you have totally changed my approach to eating. Thank you for being such an inspiration. Made this last night and had some for breakfast this morning. It's so good! Even my fussy 7 yr old daughter likes it, she had it for lunch today!! Thanks for posting the recipe, Joy! I must get Julie's book. Thank you so much for the kind words and support! I am so lucky to have you as a friend:-) Big Hug ! Made this last night and can't stop eating it!! I forgot the almond milk so it won't really hold together ... but that doesn't really stop me! :-) Having it this morning with some chocolate chips melted on top and some natural yogurt! Yum! Thanks for the recipe, Joy! i just made this and it was very yummy!! how long does this keep for? and does it have to be refrigerated?? yes I suggest you refrigerate it and it will keep for 4-5 days.Enjoy!